Trisuli River Rafting, flows from the glacial source of Ganesh and Langtang Himal range of massive mountains, where later other tributaries river joins to make greater Trishuli River, a popular river for rafting, as the river runs downstream by the side of Nepal main highway and all the way to southern areas of Chitwan. 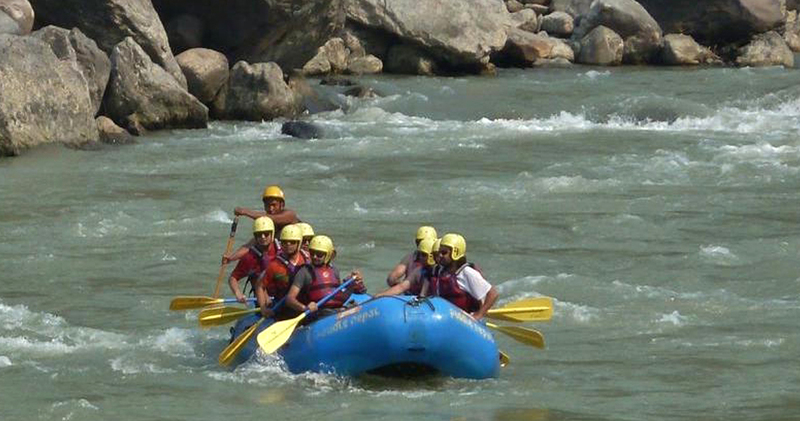 Trishuli with friendly and enjoyable rapids, an ideal float for beginners, family and as well for birdwatchers where you can spot many different species of bird life along the river and at its sandy shore line, lined with thick lush verdant forest where some monkeys and other wild-life often spotted while rafting. 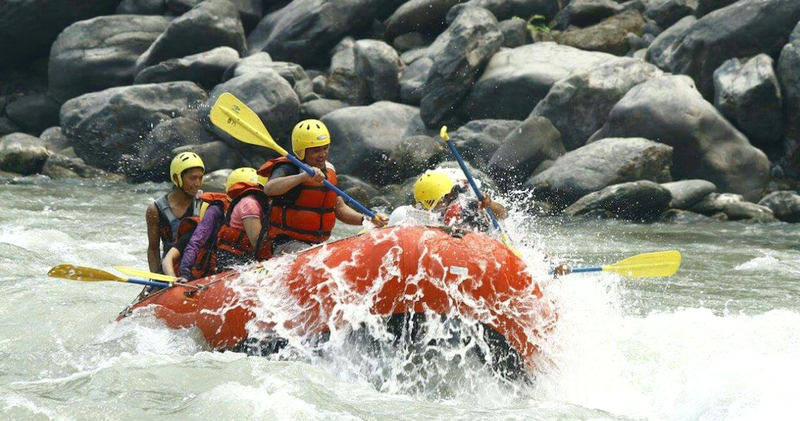 Beside its superb scenery on float one can enjoy the rural farm village life while rafting or at the end of the rafting programs where you can spend overnight in the comfort of River Lodge / Resorts or camping on sandy beaches with time for walks along the local villages. Kathmandu to Charaudi to Kathmandu by tourist bus. Morning pickup at 6.00 am, after early breakfast from the Hotel our transport with the guide will accompany you all the way to Charaudi or further on the main busy highway, the scenic drive will take not less than two or three hours. 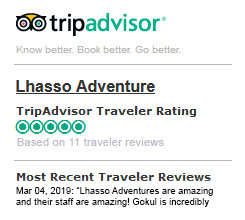 On arriving Charaudi, a small village in the middle of the highway, our river guides and Captain of the raft will receive you, a short walk to the beach where you can see our boys preparing and inflating the raft for exciting adventure on Trisuli River. Before getting into raft you will be thoroughly briefed by our Captain about Rafting, safety procedure including some paddling technique regarding the river as per the water levels. Lunch is prepared here by the bank of Trisuli river, (if it’s early sometimes we prepare lunch further downstream) prepared and served on large plastic tarpaulin. After lunch, your valuable, money purse, camera and sunscreen is put in a safe water-proof and tight barrel, what you need for the Rafting for the day is all put in the barrel. Once getting organized captain of the boat will divides the group in best and safe seating order to balance the raft. Once in the Raft you’ll have helmets, life-jacket and paddle each. As the seating order is settled the Captain seats will be on the back with its oar or steering paddle. Once in the river, you will have a brief instruction on paddling, the float down stream takes you through many interesting and exciting rapids, like twin-rock, ladies delight, monsoon and the most heart pounding rapids of all are “Upset” (an infamous class IV rapid with a huge curly waves) after Upset it passes through “Surprise” and before the end of the trip Bijili rapid will give you a big wash, then back to the bank of the river at Kuringhat, where our transport will be waiting with your nice warm dry clothes, after a change into warm gear a 2 1/2 to 3 hours drive will bring you back to the Hotel in Kathmandu after an exciting, thrilling whitewater rafting. Best Season : Nearly all seasons of the year except wet monsoon months (June to August) March to May when wild-flowers are in season with clear morning for walks and views.